Return to Sender is New Zealand’s leading manufacturer of new design caskets appealing to those who appreciate the Eames or Conran design principles of clean lines, intelligent construction and minimal componentry. Their award winning casket, the ‘Artisan’, is sturdy but lightweight and made from locally resourced materials. Its curved shape is the perfect canvas for Return to Sender’s latest innovation, a new range of designs inspired by regional iconic landmarks. 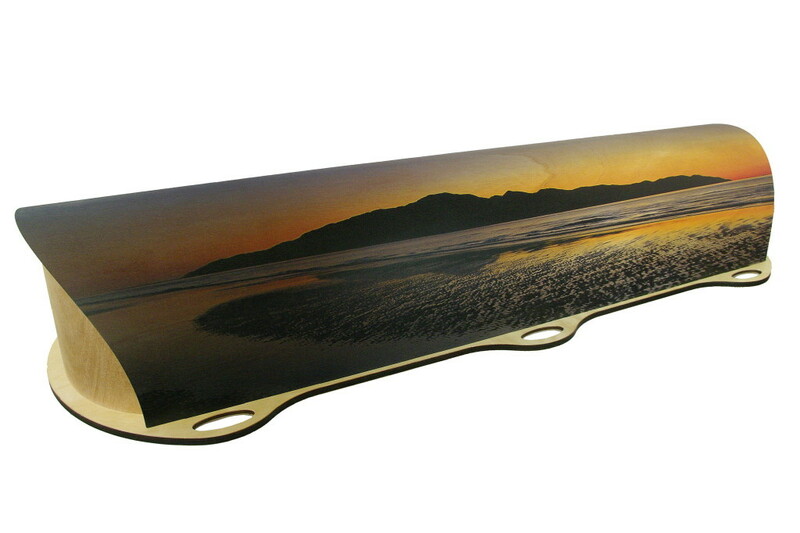 The ‘Wellington’ casket, launched at the recent Celebrants Association Conference, has a stunning image of Kapiti Island at sunset overlooking the Tasman Sea from Paraparaumu. Perfect for families or individuals who are proud Wellingtonians with a strong sense of connection to their natural environment and seascapes. Designer, Greg Holdsworth, says families increasingly want to express the individuality of loved ones. Return to Sender can create a wide range of designs: images of favourite cars, family photos, pets or nostalgic locations. They challenge our typical view of caskets and enable families to think creatively. If you are arranging the funeral yourself or engage Broadbent & May, the natural, designer and Wellington ‘Artisan’ caskets and Return to Sender’s entire range are all available directly from us. Broadbent & May – our second year.